The midday sun is scorching, the days are long and the produce of summer is beginning to peak. Summer is high time for salads. That’s partially because gardens and farms are churning out greens like lettuce, arugula and spinach almost faster than we can keep up. It’s also due to the fact that on hot nights, it’s nice to take a break from the stove and serve a crunchy no-cook meal. 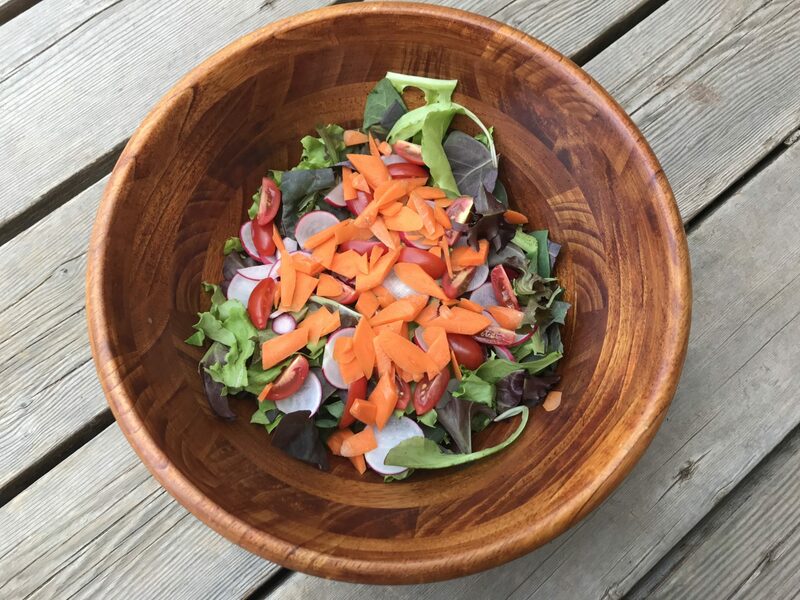 And since many veggies are at their peak in summer, throwing them on a salad is a great no-fuss way to honor them in their purest, healthiest and most delicious form: raw. That said, it’s important to stay creative and switch things up, especially if you grow salad greens (and therefore have to eat all those greens). Luckily, the options for variation are endless. There are chopped salads, classic Cobbs, taco salads, the French-influenced Nicoise, Asian-inspired slaws, or iconic wedge salads. But there are also many techniques for keeping salads — whether simple side salads or full-blown entrees — interesting. First, don’t limit yourself to just romaine or iceberg for the foundation of your salad. Switch it up by mixing in spicy arugula, dark spinach, mild butterhead, sharp frisee, shredded cabbage, colorful loose-leaf or hardy kale (massaged kale is a great base for salads.) Add a handful of fresh herbs or chopped chives for an extra pop. That’ll also help keep those herb gardens in check. Second, balance it out. A great salad will contain a mix of textures and a balanced flavor profile that includes salty, acidic, fatty or sweet. Think about combining the crunch of veggies like radishes with the softer texture of avocados, or shred ingredients like beets for a different bite. Get creative with ingredients like roasted sweet potatoes, grilled asparagus, toasted pumpkin seeds or julienned jicama. Add toasted nuts for salt, fruit for a touch of sweetness (chopped apples, blood orange segments and golden raisins are great options) or grains such as quinoa or barley for bulk. My dad used to disparage salads as “bird food,” but packed with protein and loads of high-fiber veggies, they can be substantial mains. And there endless ways to add this kind of heft. Grilled chicken, hard-boiled eggs, baked tofu, water-packed sardines, fried chickpeas, leftover taco meat or marinated lentils are a few ideas. Finally, think about making your own salad dressings. Not only are they nearly as easy to make as shaking a bottle, but they don’t have additives that most bottled dressings contain, are cheaper per serving to make and they are exponentially more tasty than store-bought varieties. Plus, making them from scratch ensures that you can use high-quality oils that will draw out the most nutrients from your veggies. Most dressings can be made with a simple formula: 3 parts oil (such as extra-virgin olive oil, flaxseed or hemp seed); 1 part acidic (such as vinegar or lemon juice); salt and pepper and extra flavorings like fresh herbs. Once you have a base down, it’s easy to get creative with ingredients like tahini, lime juice, shallots, sesame oil, buttermilk and Greek yogurt. Here’s a recipe for a dinner salad that is easy, versatile and perfect for a hot summer night. Pile veggies, chickpeas and eggs on top of greens. Whisk garlic into lemon juice, add salt, then add ¼ cup olive oil and emulsify. Serve over salad, and enjoy! Next post: Stone Fruit, Melons and Berries, Oh My!